Welcome to Hobnobber’s Variety Bar & Restaurant. 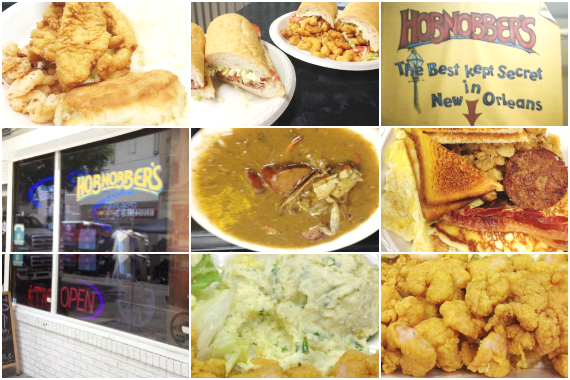 We cure huge appetites in New Orleans, LA with our homestyle flavors and portions. Bar open Mon.-Sun. 10am-3am. Restaurant open Mon.-Sat. 6am-2pm. "We can't wait to help transform your day!" "Dust off that thesaurus -- or just whatever comes to mind!" "This isn't just breakfast, it's a way of life." "They look like shrimp, but they're actually known as Instant Day Improvers." "Your feedback is our secret ingredient. http://bit.ly/2G3GNLC"
The restaurant is truly a hole in the wall, but the food was really good..if you are looking for fried fish. This is your spot.. Yes, I'd like to receive news from Hobnobber's Variety Bar & Restaurant. Sign up for the Hobnobber's Variety Bar & Restaurant Newsletter!